A natural problem in scheduling theory is to provide good average quality of service to a stream of jobs that arrive over time. In this paper we consider the problem of scheduling n jobs that are released over time in order to minimize the average completion time of the set of jobs. In contrast to the problem of minimizing average completion time when all jobs are available at time 0, all the problems that we consider are NP-hard, and essentially nothing was known about constructing good approximations in polynomial time. We give the first constant-factor approximation algorithms for several variants of the single and parallel machine model. 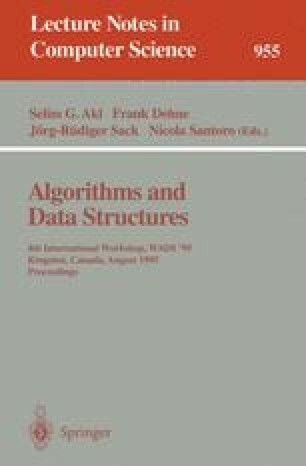 Many of the algorithms are based on interesting algorithmic and structural relationships between preemptive and nonpreemptive schedules and linear programming relaxations of both. Many of the algorithms generalize to the minimization of average weighted completion time as well. This work was performed under U.S. Department of Energy contract number DE-AC04-76AL85000.